VIMS Crew The 2012-13 PAL-LTER crew from VIMS: Josh Stone, Miram Gleiber, Deb Steinberg, Brandon Conroy, and Kate Ruck. Palmer Station and the Antarctic Peninsula are in the background. Penguins Penguins with the research vessel Laurence M. Gould in the background. Palmer Station The U.S. Palmer Research Station sits on Anvers Island near the Antarctic Peninsula. RV Laurence M. Gould The research vessel icebreaker Laurence M. Gould. Photo by Hugh Ducklow. RVIB Gould The research vessel Laurence M. Gould docked at the U.S. Antarctic Palmer Research Station. Krill Gang From L: Kate Ruck, Joe Cope, Glaucia Fragoso, Deborah Steinberg, Lori Price, and W&M senior Miram Gleiber show off krill aboard the RV Laurence M. Gould. Palmer Researchers From L: W&M senior Miram Gleiber and VIMS Master's student Glaucia Fragoso with Professor Deborah Steinberg aboard the R/V Laurence M. Gould with the Antarctic continent in the background. Photo from the 2008-09 field season. 2011 VIMS PAL-LTER crew The VIMS team, led by Professor Deborah Steinberg, is on a 6-week research cruise along the Antarctic Peninsula as part of the Palmer Antarctica Long-Term Ecological Research project. The team is studying the effects of climate change on the Antarctic food web. From L: Caitlin Smoot, Kate Ruck, Lori Price, Deborah Steinberg, and Joe Cope. Antarctica is a land of superlatives—the world's coldest, windiest, highest, and driest landmass. It's also home base for a wide range of oceanographic research by faculty, staff, and students at the Virginia Institute of Marine Science. As surprising as it may seem, much of this work has direct connections to our local waters. VIMS professor Deborah Steinberg is currently working down under, while many other VIMS researchers have previously conducted research in Antarctica. Their shared goal is study of Antarctica's coastal waters and marine life to help better understand, conserve, and manage the polar ecosystem—and to shed light on Virginia's possible climate-change future. Their work is funded largely through the National Science Foundation's Office of Polar Programs. Steinberg leads VIMS' involvement in the Long-Term Ecological Research program at the U.S. Palmer Station on the Antarctic Peninsula. Annual winter temperatures here have increased by 11°F during the last 50 years, 5 times the global average. Steinberg's team studies how this warming impacts zooplankton—small animals such as krill that eat phytoplankton and in turn are preyed on by fish, penguins, and whales. The team is particularly interested in how warming might change the species of zooplankton that dominate these waters, and how such changes will affect the "biological pump"—a process that can move carbon dioxide from the atmosphere to the deep sea, where it contributes nothing to global warming. 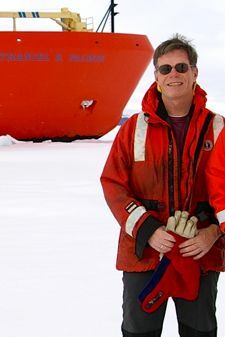 VIMS professor Walker Smith, who began studying Antarctic waters in the early 1980s, has literally written the book on polar phytoplankton (and edited the multi-volume Polar Oceanography). His studies of microscopic floating plants in the Southern Ocean help reveal the fundamental workings and year-to-year variability of the Antarctic marine food web. In the late 2000s, Smith, then-VIMS professor Kam Tang, and their graduate students collaborated to explore the biology of Phaeocystis antarctica, an important primary producer in the Ross Sea. Their studies, based at the U.S. McMurdo Research Station, showed how this organism's ability to quickly recover from months of total winter darkness and frigid water temperatures allow it to dominate the spring phytoplankton "bloom," a key event in the polar year. In the early 2000s, Ph.D. graduate Heidi Geisz worked with VIMS professor Rebecca Dickhut to study the accumulation of persistent organic pollutants in Antarctic seabirds. Their work showed that DDT and its breakdown products persist within the tissues of Adélie penguins, three decades after use of the powerful pesticide was banned in most countries. They caution that accelerated melting of glacial ice due to global warming could lead to a further increase in contaminant input to Antarctica's coastal waters. VIMS scientists have also plumbed the polar depths. In 2007, an international team including now emeritus VIMS professor Robert Diaz found hundreds of new marine species in the depths of the Weddell Sea—the bottom of the bottom of the world. These carnivorous sponges, free-swimming worms, crustaceans, and molluscs provide new insights into the evolution of ocean life, and reveal unexpected vitality and diversity in a world of 30°F temperatures, total darkness, and bone-crushing pressure. The expedition sampled at depths from 3,000 to more than 20,000 feet. 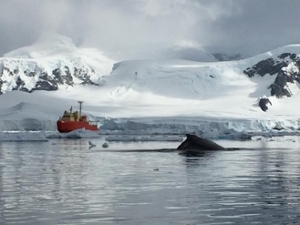 In 2008, former VIMS professor Mark Patterson brought the latest in marine technology to Antarctica, testing whether his autonomous underwater vehicle Fetch could be used to assess krill populations in the frigid and wave-tossed waters of the South Shetland Islands. 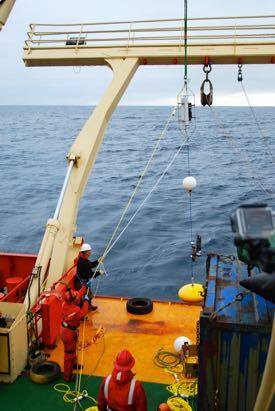 In 2017, then-VIMS professor Shadwick deployed a high-tech mooring beneath the seasonally ice-covered waters around Antarctica to better understand ocean acidification in polar regions, particularly during the poorly studied winter months. To date, knowledge of CO2 levels in the Southern Ocean around Antarctica relies almost exclusively on data collected by research vessels and resupply ships during summer's brief window of ice-free water. Her mooring will extend this record year round, right through the long polar winter. Although Antarctica's waters are a world away from Virginia and VIMS, VIMS research shows that they are more closely linked to our own backyards than we typically know or appreciate. Greenhouse gases from our cars, homes, and factories don't remain in the air over Virginia or other parts of the developed world. Their concentrations are rising uniformly around the globe, linking the hazy skies of the mid-Atlantic to the clear air of Antarctica and the surface waters of the Southern Ocean. The effects of climate change are also global, and human-induced changes in the climate and ecosystems of Antarctica could boomerang to impact Virginia. The Antarctic Ice Cap holds 70% of the world's fresh water, and would raise sea level by 50-60 meters (160-200 feet) if warming caused it to melt. Melting of the West Antarctic Ice Sheet is more likely, and would raise sea level about 6 meters (20 ft.). Even a few meters of sea-level rise will significantly affect the Chesapeake Bay ecosystem and Virginia shoreline. VIMS' Antarctic research can help society better understand, predict, and manage future changes in climate and sea level by providing fundamental input to the ocean component of global carbon models. The research also throws light on the ground state and variability of the polar food web, crucial management knowledge as commercial fisheries begin to move into the fertile coastal waters of the Southern Ocean. Antarctica and the Southern Ocean comprise almost 20 percent of the Earth's area and represent our planet's largest remaining frontier. Research here not only promises human benefits seen and unforeseen but helps lift the human spirit. The early explorations of Amundsen, Scott, Shackleton, and Virginia native Richard Evelyn Byrd are monuments to human inquisitiveness and perseverance that still motivate today. VIMS' research in Antarctica continues this tradition, and helps bring the Commonwealth international recognition, economic and intellectual capital, and the intangible benefits of exploring the unknown.